Marvin Isley joined the group in 1973, when the group expanded to six performers. 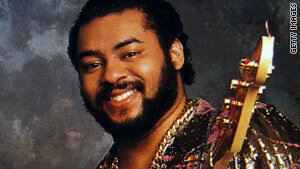 (CNN) -- Marvin Isley, youngest member of the soulful Isley Brothers R&B group, has died from complications with diabetes, hospital officials said Monday. He was 56. Isley passed away Sunday morning at the Seasons Hospice within Weiss Memorial Hospital in Chicago, Illinois, according to representatives at both facilities. The original group formed in 1954 with the three eldest brothers Isley -- O'Kelly Jr., Rudolph and Ronald -- which recorded several singles, including "Shout," "This Old Heart of Mine" and the Grammy-winning "It's Your Thing." Marvin Isley joined in 1973, when the group expanded to six performers. The full group enjoyed massive radio airplay with lists of hits, including "That Lady," "The Heat is On," "Go For Your Guns" and "Fight the Power." The Isley Brothers were inducted into the Rock and Roll Hall of Fame in 1992. Marvin retired from performing five years later, and eventually diabetes led him to have both legs amputated.